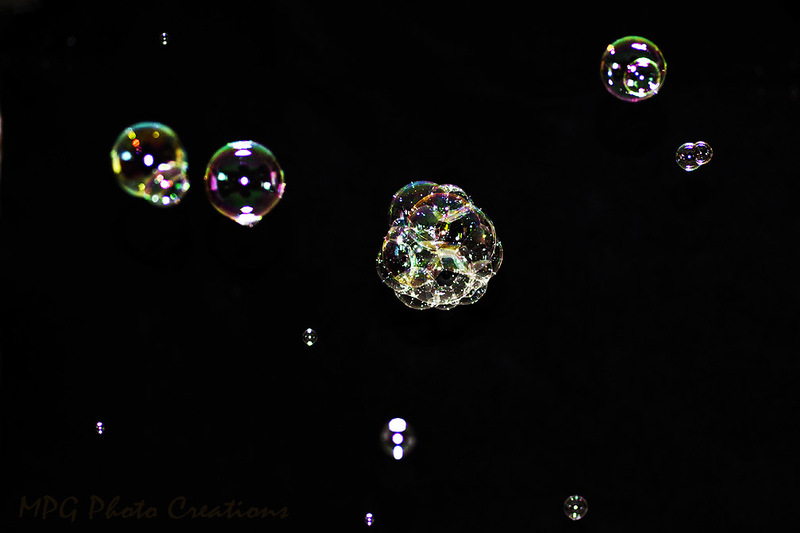 The theme for my Black and White project was Bubbles. It looked pretty cool in B&W but when I was looking at the images I liked the colors that were captured as well and thought I would share a shot here. It's fun to play and share different things sometimes than the usual. The hubster helped me out with this by blowing bubbles in front of a dark background while I snapped off shots. Once we got the bubble mix right and I figured out the right shutter speed because even flash shots were blurring, it started to work pretty well. I think the cat thought we were a bit odd but.... :-) I also liked the way some of the bubbles clustered together and made neat colors too.